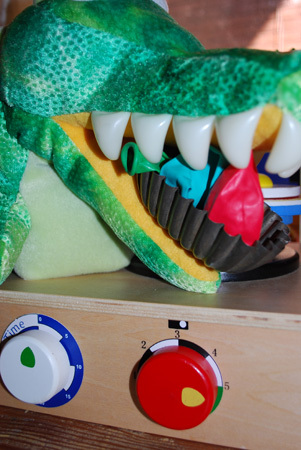 An alligator chewing on the coveted balloons, which are inside a tin I bought at a yard sale this weekend. Here’s a great rainy (or sunny) day activity…a treasure hunt. The kids requested a treasure hunt this morning and rather than draw a map like I usually do, I used my daughter’s Vtech digital camera to take pictures of objects near the treasures. The kids scrolled through the pics and figured out their location. The pictures get progressively harder to identify. Plus some of the toys were not in their usual places, so those finds were a little more challenging. I refrained from making this a lesson in putting your toys away and let them have fun while being stumped. The first round involved “treasures” I had around the house: unused stickers from the sticker bin, balloons (the biggest hit), tumbled rocks, and some cards they can write notes on later. By the second and third treasure hunt, I ran out of treasure. My daughter suggested using candy from a recent birthday party as the booty. The kids have since made it their own game, taking pictures of objects for each other to identify. IDing and stumping each other is the “treasure” now. This was an awesome activity that occupied more than a hour and I had nothing to clean up afterward. That’s a great game. Next time, we’re going to try it outside.